What's the Difference between Tooth Implants and Teeth Implants? Technically, they are called dental implants, but we find people Google “teeth implants” if they need more than one, or “tooth implants” if they only need one. Thinking about it, if you only need one, it should be “tooth implant”, not “implants”! However, we don’t really care what you call them because we are the Bay Area experts for teeth implants or a tooth implant! 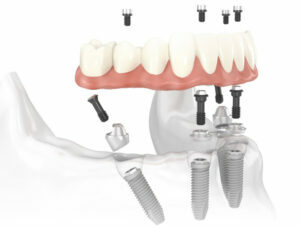 There is no question that teeth implants are by far and away the best solution for replacement teeth. That is because they perform and behave exactly like the tooth or teeth that you have lost and need to replace. It’s a sad fact of life that most people lose teeth as they get older, some because it is just a natural progression, some because of their lifestyle choices: eating lots of sugary foods, for example, can help speed the loss of teeth, particularly if that is combined with a not very good regimen of teeth cleaning. Plaque is caused by bacteria which live in the mouth and build up on the tooth. The bacteria produce acids which, over time, destroy the enamel, resulting in tooth decay. Plaque can also build up on the roots of the tooth below the gum line and destroy the bone supporting the tooth root. Whatever the cause, when you lose a tooth, or more than one, you need to replace them, because if you do not you will find it harder – or even impossible – to eat certain foods, and you may also suffer extreme embarrassment in front of other people when smiling or laughing. At San Francisco Dental Implant Center we grow smiles! If you live in or near San Francisco, and need “teeth implants,” give us a call for a free consult. Our doctors, Dr Alex Rabinovich and Dr Noah Sandler are both dental implant specialists of many years’ standing, and tooth replacement with dental implants is what they do every day. There are many general dentists who undertake dental implant work but may only do one or two here and there. When you have something as important as your oral health to consider, we think that you would like the help of an acknowledged expert rather than a general dentist. We have said this before, but there is no harm in repeating it: if you own a Maserati you wouldn’t take it to Bob’s Garage in the next street for its’ service. You would take it to the Maserati dealer because they are the experts and have all the specialist equipment to service your car. When it comes to servicing your mouth and your health, what could be more important?